Any of us who’ve sailed a long downwind leg on a cruise usually chose efficiency and stability over extra speed, especially when short-handed – the usual situation on a cruise. So, we fall off and steer a little deeper off the wind, push the main out to leeward, push the headsail out to windward, and go. Nothing new about that. It’s just wing-and-wing – we’re constantly careful about the main, and keep steering and trimming to keep the headsail full. That’s a lot of work. The stress-free way involves a whisker pole, running rigging we already have, a couple of blocks, and a couple of lines, and a couple of minutes. 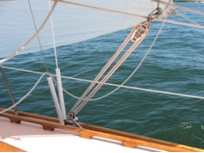 Most of us use extendable whisker poles, because the pole needs to be as long as the foot of the sail in use – and where do you store a 27 foot pole on a 36 foot boat? 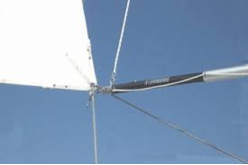 Forespar offers several types, ranging from twist-lock adjustables for small and medium boats, line control poles for varying length for sails with heavier loads, all the way to designs for use with asymmetrical spinnakers. Setup is simple. The inboard end attaches to the ring on the spinnaker car, and outboard end to the sheet. Trim on the sheet, and sail away (See above). For the larger poles, bigger sails or heavier air, we generally use a topping lift to stabilize the pole. It’s also common to use the lazy sheet as a quasi-foreguy if the sea is bumpy, or the air is light (See Below). We want to prevent the mainsail boom from an accidental jibe, caused by a wind shift, an errant wave or a steering error. When that boom sweeps across the cockpit in any breeze at all, it’s hard on the equipment, and sometimes hard on the crew. So, we rig a preventer. The old-school method is to run a line from the boom end forward (outside the lifelines) to a block attached well forward, usually on the toe rail. The line then runs aft to an unused winch or cleat. Between the mainsheet, vang, and preventer, the boom’s position is steady and easily adjusted, and it won’t come ripping across the boat. A very effective preventer for lighter boats boats under 40 feet is the racers’ expedient. 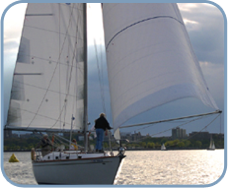 Many of us use a separate boom vang rig, readily available at most sailing supply sellers. The snap shackle on one end attaches the bail on the boom – usually the one that’s already there, and the other snaps onto the toe rail forward of the boom’s position. Ten seconds on, five seconds off, easily adjustable. A long downwind leg becomes a lot easier, and a lot more stable with a pole and a preventer. Easy to rig and trim, easy to stow, and easy on the crew. We’ve done it, a lot, and we like it, a lot. Mike Dwight May 2, 2015 Category: Uncategorized.